Not much moves on a scorching hot summer’s day in downtown Tupelo, Mississippi. Even the tarmac melts, and when there’s a breath of wind it’s like an oven door opening. Which rather makes you wonder where Elvis Presley – whose hometown this was – got the energy to curl his lip, let alone wiggle a hip. You’ll get some idea at the annual Tupelo Elvis Festival – this year’s, the 21st, is held from 5–9 June – which puts on what I am fully prepared to believe is the ‘Ultimate Elvis Tribute Artist Contest’. It also hosts a 5km run – a run! – which, in this heat, is basically a legal way to kill people, as far as I can see. The ‘Elvis Pet Look-a-like competition’ raises temperatures too. If you didn’t know Elvis was born here, you might just drive on by. Certainly few tourists come to town (named after the Tupelo gum tree) because of its unheralded status as the world’s largest manufacturer of upholstered furniture. A small town in America’s Deep South bible belt, Tupelo has more than 200 churches, an alcohol ban on Sundays, and an old-fashioned downtown with the standard Southern accoutrements: drug store, gentleman’s outfitters, and a ribs-and-BBQ restaurant. But stick around, even outside festival time. Nearby Memphis in Tennessee may have Graceland – the house Presley bought when he was a rich young man of 22 – but Tupelo is where it all started for the King. Elvis’ birthplace is a humble 1930s’ two-room wooden cottage known as a shotgun house (because you could blast a shotgun down the corridor from the front to the back door without hitting anything). Porch out front, a single light bulb in each room, Elvis’ twin brother Jessie stillborn in the same bed in the only bedroom. There’s also the family church – now moved to the site of the birthplace museum – where the Presleys prayed; while in town you can also see the hardware store where his mother bought him his first guitar; the two schools Elvis attended until he was 13; and the fairground where he gave early, wild performances in 1956 and 1957. And every time you step outside, there’s that heat again, which shapes the whole of Mississippi life. Locals joke that it’s the reason that Southerners all talk so slowly – too darned hot to talk fast – and it’s true that people can squeeze an extraordinary number of syllables into a word like ‘fine’ or ‘time’. The heat and Elvis combine to do strange things to a person. Witness one Paul MacLeod, once the self-proclaimed ‘World’s No.1 Elvis Fan’, who turned his rather spooky and ramshackle house in Holly Springs, an hour to the north of Tupelo, into a public shrine called ‘Graceland Too’. I visited there once, and Mr MacLeod clearly had what you might call ‘issues’ – shaking his legs alarmingly as he chirruped another Presley song on the escorted tour around his quite mad collection of Elvis memorabilia. In 2014, MacLeod killed an intruder at his house and, a couple of days later, was himself found dead in a chair on the porch of Graceland Too, apparently from natural causes. The house was sold and its contents auctioned off – the story is told well here in the Paris Review – and one man’s all-encompassing obsession is no more, which is probably just as well. If you’ve read or seen Stephen King’s ‘Misery’ – about the treatment meted out to a captive author by a deranged super-fan – you can begin to appreciate quite how unnerving a visit to Graceland Too was. Holly Springs though is lovely, a rather fine example of a northeastern Mississippi town which survived the Civil War intact. Its antebellum homes and small town square provide a neat contrast to the wide streets and undistinguished buildings of Tupelo, while Phillips Grocery (541 East Van Dorn Avenue) – a crumbling wooden joint straight out of ‘Fried Green Tomatoes at the Whistlestop Cafe’ – serves what are arguably the best homestyle burgers in the south. I’d say that’s worth an hour’s drive, for some good old southern hospitality. Burgers of course weren’t so kind to Elvis in the end, whose waistline expanded in the 1970s along with the lapels of his gemstone-covered stage suits. Burgers and the prescription drug abuse, which ended up killing him at 42, sprawled out in the bathroom of his Graceland mansion after suffering a heart attack. 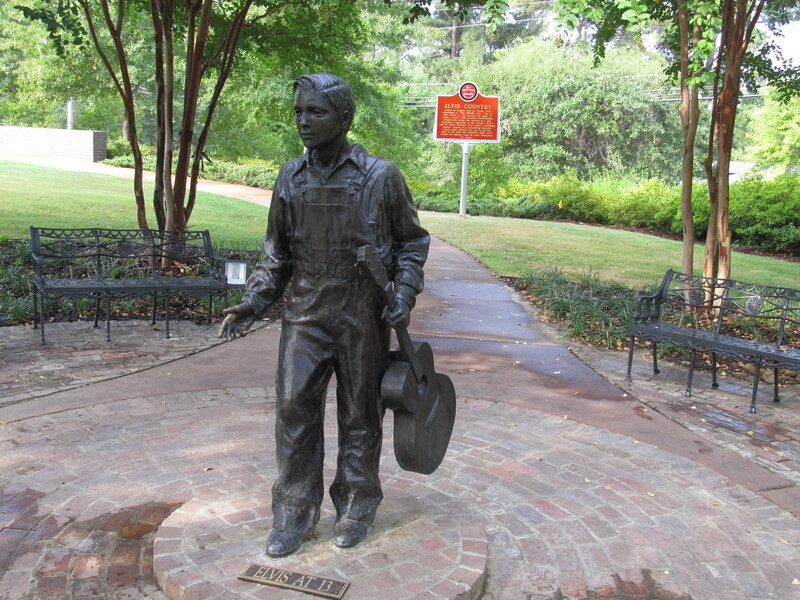 But back in Tupelo, the King is forever 13 – his age when the family moved away to Memphis to seek a better life. A bronze statue at the house captures his innocence at that age – the slicked-over hair, the over-sized dungarees, the simple shirt and shoes, the clothes of a poor child. Back then fame and fortune still awaited, while Tupelo slumbered on in the heat, wondering whatever happened to the Presley boy with the sweet voice and the $8 guitar from the local store.